Storrs Gate House Guest HouseBed and Breakfast of the Year, Cumbria Tourism Awards 2009. Storrs Gate House has a five star grading with Visit Britain. Vince and Shirley welcome you to our luxury family-run country guest house, situated opposite lake Windermere. We are delighted to present 7 beautiful en suite bedrooms and suites with the attention to detail and furnishings worthy of any highly rated large hotel, but with the friendly atmosphere of a welcoming B&B. After a comfortable night in a sumptuous 4-poster or king-size bed, wake up to a refreshing power shower with luxury toiletries by the White Company followed by personal service at breakfast, where you will dine at individual tables looking out over romantic private gardens. Enjoy excellent home cooking using fresh and local produce, home-made jams, marmalades, yoghurt and muffins, free-range farm eggs, gold award winning Cumberland sausage or vegetarian options. Ample private parking is provided in our grounds. For the less mobile, we can offer 2 elegant ground-floor bedrooms and wheelchair access with separate ramped entrance, information sheet available. A stunning lakeside stroll will take you into Bowness-on-Windermere in just 15 minutes with an abundance of restaurants, shops and activities to choose from. Bed and Breakfast of the Year, Cumbria Tourism Awards 2009. Storrs Gate House has a five star grading with Visit Britain. Vince and Shirley welcome you to our luxury family run country guest house, situated opposite lake Windermere. Two luxurious ground floor en suite rooms with wheelchair access. One 4-poster with adjoining lounge and a 4-poster with adjoining dressing room. Children welcome from age 12. Storrs Gate House sometimes limits bookings to 3 or more days. Children are accepted from 12 years. Room 2 - Jacobean king-size 4-poster bedroom with adjoining sitting room and en suite power shower. Satellite TV/DVD player. Luxury toiletries by The White Company. First floor. 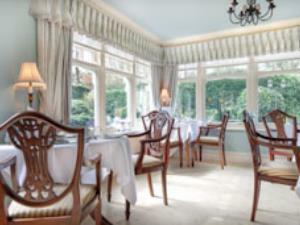 Jacobean suite sometimes limits bookings to 3 or more days. Room is located on the second floor. Standard King sometimes limits bookings to 3 or more days. Storrs Gate House is situated at the junction of the A592 and the B5284, opposite Windermere Marina and lake Windermere, 0.5 mile south of Bowness Bay. Fabulous stopover for one night and we then wished we were staying longer.... We were given an upgrade as they weren't full and the room was beautiful with a four poster bed and easy chairs and a large, modern bathroom with a good shower.The breakfast was delicious with an excellent menu which they served at our table. Lovely touches of home made granola, jams etc and the cooked breakfast was very well done. The location is amazing, right next to Lake Windermere. We would definitely use this B&B again.